Beginning this week, Moto presents Elyas (a.k.a KiD [SiC]) every other Thursday. MOTO is a beautiful new restaurant and bar in East Williamsburg sets the perfect background for Kid Sic’s brand of cinematic songwriting. 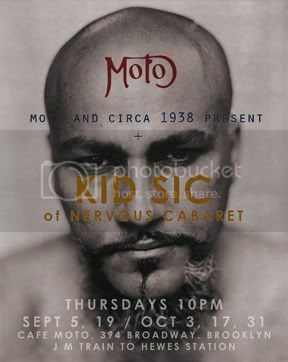 Kid [SiC] will be joined by the rest of Nervous Cabaret at monthly appearances beginning later this fall.